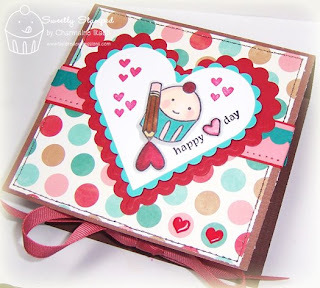 Stamp a Sweet Impression: Happy "Heart" Day! Remember a couple of months back when I created this Cupcake Kit? 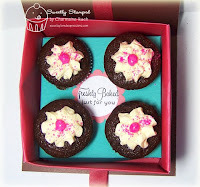 Well, I thought for this post I would actually MAKE the mini cupcakes rather than just give the dry ingredients as a gift. I made the Origami Box that was featured for one of the Technique Lover's Challenges on Splitcoaststampers a couple of weeks back. I added my own little insert to hold the cupcakes inside. I've included a mini-tutorial for how I created the cupcake insert. The directions for the Origami Box can be found by following the link above. 1. Start by cutting a 5" square piece of cardstock. 2. Score at 1/2" on all four sides. 3. 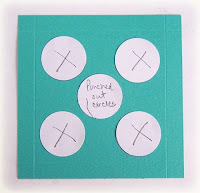 After making the score lines, punch out 5 circles from scrap paper using the 1 3/8" circle punch from Stampin' Up. 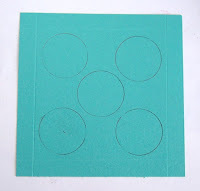 Arrange these circles on the 5" square piece of cardstock (inside the score lines) for spacing. 4. Once you are happy with how they are spaced, use temporary adhesive to hold them in place while you trace them. 5. 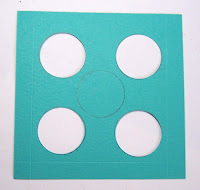 Remove the scrap circles and then use the 1 3/8" circle punch to punch out the four corner circles using the traced circles as your guide. 6. Cut on ONE of the 1/2" score lines at each corner so that you can fold them and attach the "tab" behind the neighboring side. Attach your sentiment circle over the center traced circle. NOTE: If you happen to cut out the little squares at each corner, it's okay! The insert will still stand in the box, just not alone. Having the little tabs and connecting them to the neighboring sides just reinforces the insert stand. 7. 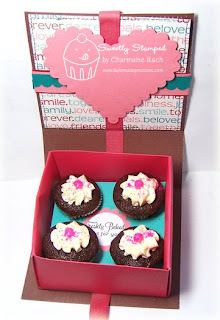 Place insert inside box and add mini cupcakes! 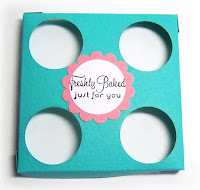 I have a mini muffin pan that makes 12 mini cupcakes at a time. . .that's enough mini cupcakes for 3 of these gift boxes! The origami box doesn't take too much time to make. . .it's the embellishing of the box! :) You could be working on your boxes while your muffins are baking! I used the Love Is Sweet set for the image on the front of the box, and the Tag Treats set for the sentiment inside. You can make the box as decorated or as plain as you like. The recipient will be just tickled with the mini sweetness that's inside! SUPPLIES USED: Stamps- Love Is Sweet, Tag Treats (Taylored Expressions); Ink- Tuxedo Black (Tsukineko), Pure Poppy (PTI); Paper- Valentine Key Ingredients, Choice Snow White cardstock (Taylored Expressions), brown and rose cardstock (DCWV); Accessories- Copic markers, 1 3/8" circle punch, scallop border punch, scallop circle punch (SU), heart brads, grosgrain ribbon from Valentine Key Ingredients (Taylored Expressions), Scallop Heart and Plain Heart Nestabilities (Spellbinders). 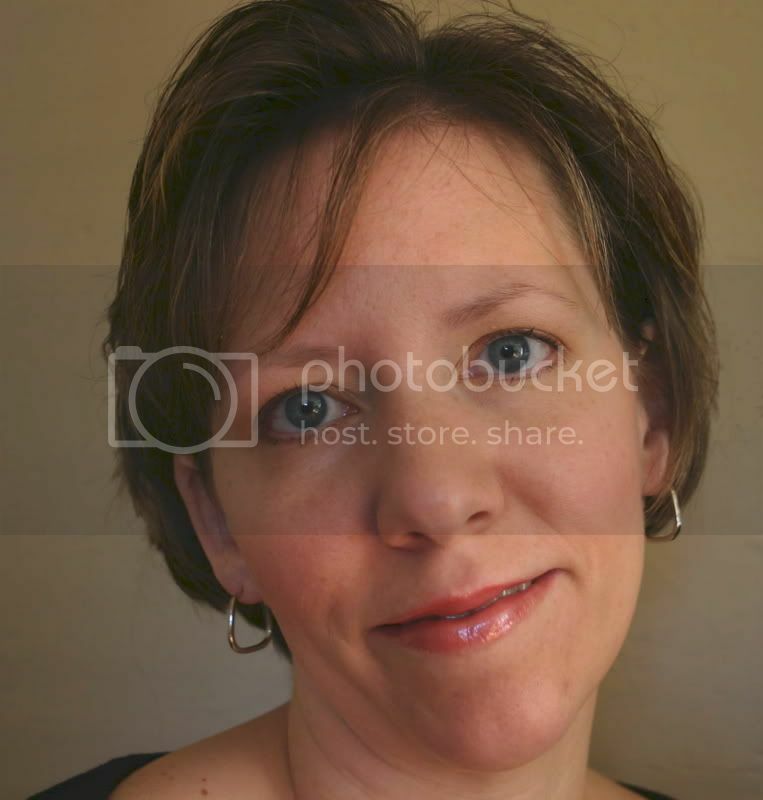 What an awesome tutorial Charmaine!! I just might have to try this!! What a FABULOUS idea and awesone tutorial Charmaine! I am totally going to try this!!! Adorable project and thanks for sharing the tutorial!! Ditto, ditto, ditto! I have marked this with a star in my Google Reader to refer back. Thanks so much! Now that is cute, but it looks like a lot of work, but probably isn't! Great job Charmaine! Wow! What an awesome cupcake box Charmaine. Love the colors, the great top... and the cupcakes look yummy! TFS! Fantastic project, Charmaine!! Thanks for the wonderful tutorial!! Holy Moly~~~I love it!! The colors the perfect and I can almost taste those cupcakes!!! Great project! I was thinking of what I could make for the teachers I work with for Valentine's Day. This is it!!!!! Thank you so much for the inspiration! Wow! What a fabulous idea! Thanks for the instructions! This absolutely the sweetest little project; what an adorable gift for someone..thanks for the great tutorial..you are the greatest! this is so yummy looking!! It just doesn't get cuter!!! WOW! Oh what a great idea, so yummy.